All links stay in pages except those in boxes below. 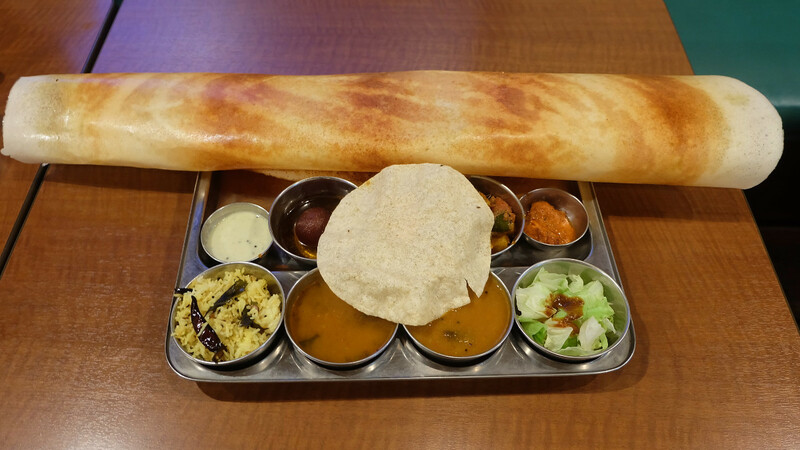 For the best Indian meal in Tokyo, including mouth-watering South Indian dishes such as dosas and idli, head to Vege Herb Saga. While the restaurant has expanded in recent years and hired a few more staff members, food is still cooked individually from fresh ingredients, so you may have a wait for your food (but it will be well worth it). For a new alternative South Indian option, with a slightly nicer venue and not as good food, which serves alcohol and allows smoking at the tables, head to the newer Veg Kitchen around the corner. For a small, pleasant restaurant serving fairly authentic Indian food with an interesting Japanese twist, head to Gopinathas. For prasadam (blessed Hare Krishna food) head to Govindas Edogawa, where they have become increasingly willing to cater to vegans. They have the only evening vegetarian buffet in the weekend in Tokyo. And for insipid, overpriced "Indian" food in a setting as pleasant as an underground basement can possibly be, which is good for introducing "Indian" food to someone who has never eaten spicy food before (and doesn't want to try it) head to one of the many Nataraj chain stores. Confession time: as much as I like living in Japan (which I really do) I'm not the biggest fan of Japanese food. Japanese food is deservedly famous for its beautiful presentation; it's said that this practice stems from tougher times in the past, when little food was available, so presenting it so elegantly was the best people could do, and over time this came to be believed to make the food taste better - something I've come to understand, strange as that may sound. I do appreciate a good bowl of ramen or plate of sushi, or shojin ryori feast, but for me no arrangement of rice and vegetables, however fresh, perfectly cooked and impeccably presented, can beat the fire and spice of an authentic Indian meal. This post is to introduce my favourite vegetarian Indian restaurants in Tokyo. You want the best Indian food in Tokyo. You want South Indian food. Two minutes walk from the South Exit of JR Okachimachi Station on the JR Yamanote and Keihin Tohoku Lines. It is also near several subway stations. I recommend having an explore around this very old Tokyo suburb. It would make a good stop before (or after) visiting Ueno Park. Please note that the restaurant moved to this nicer venue in 2015. Vege Herb Saga is my favourite Indian restaurant in Tokyo, and I think I share this with most resident vegetarian Indians and in the city.It's the 'real deal' for Jain food. Vege Herb Saga is a little piece of India, right here in Tokyo, down to the beaming chef in a white jacket and, most importantly, steaming hot delicious South Indian foods, such as Dosas and Idli. The owner regularly imports fresh spices from India (I've seen them be roasted on the same grill that will cook your Masala Dosa) and the effect on the flavour is certainly noticeable compared with all other Indian restaurants I've visited outside India. Resident Indians tell me that this extra effort - and expense - with the spices makes Veggie Herb Saga's food even better than what they can cook at home. Vege Herb Saga is the place to come for the best Indian food in Tokyo. I recently met the owner, who explained that there are several hundred Jains (strict vegetarians who live their lives in such a way to minimise all harm to living creatures) including himself living in the surrounding community - including himself - mostly in the diamond trade. He started the restaurant several years ago because, while his business was going fine, he and his visiting business people needed somewhere to eat, as Jains have an even harder time finding food than vegans (see below). During its first few years Veggie Herb Saga was housed in a rather unappealing basement, and customers would be expected to share tables with strangers (where I had many of the most interesting conversations I've had anywhere with others who had sought out Jain food in Tokyo) however it also attracted a following among resident vegetarians and vegans, and Japanese interested in Indian food; On a television show it won fifth place among all Indian restaurants in Tokyo.The restaurant has since moved into a larger, more pleasant restaurant, which appears to be a converted Karaoke bar, and on one of my visits the owner whipped out the Karaoke equipment and began singing. Jains don't eat onion, garlic or other root vegetables, as harvesting them kills the plant and disturbs more insect life than fruits and vegetables which can be picked without uprooting the plant. The restaurant does, however, offer foods which contain these for non-Jains, however in fitting with Jain principles the restaurant does not serve alcohol or allow smoking. Whatever ones opinion of Jainism and spirituality in general, like the Tokyo Loving Hut, this demonstrates a strong commitment to principles, as the standard restaurant business model in Japan is to 'give away' food and make a profit on drinks. Please bear this in mind if the restaurant appears expensive (though actually prices are hardly higher than other non-vegetarian restaurants). As an interesting aside, while Jains do consume dairy products, an increasing number of Jains (especially younger ones) are turning vegan, especially in the UK. The menu is perhaps the largest of any Indian restaurant in Tokyo. It includes all popular North and South Indian favourites, and a few completely new dishes invented by the chef. A drink, starter and main meal should come to 2000 - 3000 Yen. Vegan items are clearly labelled, but it's best to remind the waiter that you are vegan so can't eat any milk, butter, cream, ghee etc. You want to drink or smoke with your meal. Veggie Herb Saga is closed between lunch and dinner. You don't want to dine in a basement. It's walkable from JR Okachimachi Station and the two subway stations Naka Okachimachi and Shin Okachimachi Stations. I recommend having an explore around this very old Tokyo suburb. It would make a good stop before (or after) visiting Ueno Park. Yet another vegetarian Indian restaurant has joined the Tokyo scene, this one another South Indian establishment run by a former chef from Veggie Herb Saga. When I heard he was leaving to run his own restaurant I hoped it would be an upmarket dining establishment, in a different locality, giving the option of a simple ‘Indian Kitchen’ at Veggie Herb Saga or fine dining elsewhere, as these would have complemented each other nicely. Unfortunately it’s a few minutes walk away, serving similar food at similar prices, thus competing for the same Jain or other Indian vegetarian clientele. A Masala Dosa is the healthy, quintessential South Indian vegan meal. Prices at the Veg Kitchen are similar to Veggie Herb Saga, and staff are very friendly and welcoming at both. Both are open similar hours, but the Veg Kitchen stays open between lunch and dinner. The Veg Kitchen originally offered an alternative in a much nicer venue than Veggie Herb Saga, but now that Veggie Herb Saga has moved there is little difference in venue, but the Veg Kitchen is still more pleasant, being a first- and second-floor restaurant, while Veggie Herb Saga is underground. Unlike the Veggie Herb Saga, where Jain principles strictly forbid drugs, the Veg Kitchen serves alcohol and allows customers to smoke at their tables. This may be a good or bad thing depending on the customer, but I much prefer the atmosphere (literally and figuratively) at Veggie Herb Saga. The Veg Kitchen has a wider menu, including some “Indian Chinese” dishes, one of which I liked and one I didn't. The owner is very happy to accommodate vegans, however it’s necessary to ask, and when he ran through the menu he missed some items which were clearly not vegan. He also said that nan were vegan, which is possible but seems unlikely, as the menu traditionally calls for milk (and without it it’s not really nan). Vegan items are labelled on the menu at Veggie Herb Saga and I’ve never had any problems. This Indian-Chinese dish was much too oily and salty for my taste. The Veg Cafe serve alcohol, which may appeal to some, however they also allow smoking during dinner, which can be quite unpleasant (if you don't smoke). They also provide Hookah's which further add to the smoke in the air. The Veg Kitchen are quite accommodating to vegans, but at Veggie Herb Saga vegan items are labelled on the menu. During my first visit to the Veg Kitchen the Chinese dish was much too salty and greasy for my liking, the masala dosa and lacha paratha were both a little too well done, and I think they use typical curry powders and mixes. In subsequent visits I've found dishes somewhat hit and miss, with some comparable to Veggie Herb Saga and some not. 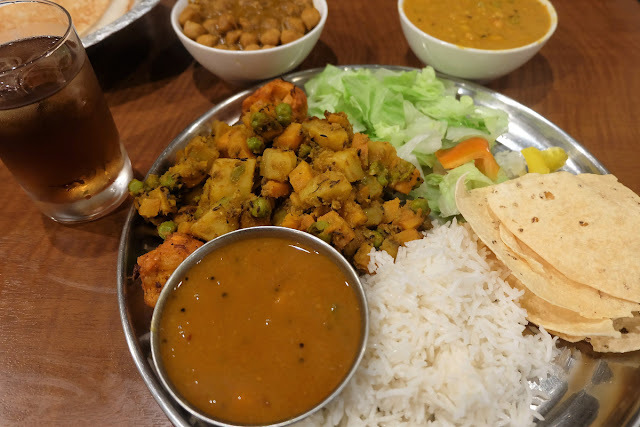 Their food is at least as good as most other Indian restaurants in Japan, and serving South Indian they are among the most vegan-friendly too, but in all fairness Veggie Herb Saga is a cut above for freshness and quality of food. In summary, these two restaurants offer a different South Indian experience, and I hope business continues to go well for both. You want to try Indian food with an interesting, Japanese twist. Closed on Monday & Tuesday. 8 minutes walk from Nakano Station on the JR Chuo Line. Gopinatha's is essentially the old Govinda's Restaurant (not to be confused for Govinda's Edogawa-ku, below, a separate establishment) which has been reopened by its former (and current) chef. Pakoras and Curry at Gopinathas. The tomato sauce on the Pakoras is amazing. Gopinatha's food is perhaps slightly more 'Japanisiced' Indian than that at Vege Herb Saga or the Veg Kitchen, but its Japanese twist adds to the flavour rather than diluting it, as is the case at Nataraj (where chilli and garam masala are optional, paid extras). Gopinatha's food certainly fresh and flavourful, and the owner/chef is very happy to make a set vegan, and they are excellent value. Gopinathas is well worth a visit, especially if you are in the area or you would like an Indian meal but don't have an hour or two to wait or want your own table. The owner is clearly passionate about vegetarianism, and has recently enjoyed vegetarian food in Taiwan. Go here because: You follow ISKCON and want Prasadam (blessed food) or a large, buffet meal. A few minutes' walk from Funabori Station, half an hour from Shinjuku Station on the Shinjuku Line. The a la carte menu includes the largest dosas I have ever seen. Govinda's Edogawa-ku is a vegetarian Indian restaurant associated with Tokyo's ISKCON temple, to which it is attached. ISKCON is the International Society for Krishna Consciousness, commonly known as "Hare Krishnas" (from their chant) in the west. ISKCON followers believe that the cow is sacred (as do Hindus) and the consumption of dairy products is an integral part of ISKCON life. Temples often have their own farms, at which the cows are treated very well so far as their welfare is concerned, and they are even cremated when they die - of course always at the end of their natural life. Unfortunately, humane as this may be (animal rights aside) it is needless to say very inefficient, and most of these farms can no longer provide enough dairy products to sustain the society's temples and restaurants, let alone all their members. So most ISKCON restaurants use dairy products from conventionally-farmed cows, which I guess in Japan probably means factory farms. Govindas is Located inside the ISKCON temple, a few minutes' walk from Funabori Station. During discussions with ISKCON followers, including in New Zealand and in India, I've often met strong opposition to veganism, and while their restaurants tend to cater to vegans (perhaps due to their food's popularity among vegans) I've never found them to be very supportive of the vegan philosophy. There are, however, a small but increasing number of (usually younger) devotees (members) who are turning vegan. On my most recent visit two of the four main dishes were vegan, but I needed to ask the helpful waiter, as vegan items are never labelled. Moments later, the same waiter appeared with the standard basket of nan and dosas, and after I (again) explained about the milk, he confirmed it had milk (seemingly unaware still that I wouldn't want to eat it, despite asking about dairy in the curries) and later re-appeared with rotis, which, as he helpfully explained didn't contain any milk. They were, however, smeared with butter or ghee. He gave up after that. Vegans will certainly need to be careful to ensure that their meal is vegan. Govindas have a weekend buffet (1800 Yen) which is now the only vegetarian Indian buffet in Tokyo. They also offer a la carte menu at all times (including weekends), with set meals (see dosa above) starting from around 1000 Yen, which are also excellent value. The weekend buffet is an excellent deal at 1800 Yen, especially when staff are willing to make vegan curries. ISKCON food is made without onion, garlic or Hing / asafoetda (a popular Indian spice) - a similar diet to the Buddhist Shojin Ryori, and Chinese Buddhist food, and similar to but less restrictive than Jain food. As such it is less flavoursome than other Indian food, but this is believed to be healthier. If you are an ISKCON follower, or would like to visit the temple to learn about ISKCON, and / or sample their food, then this is the obvious place to come, and if you would like a hearty meal from an all-you-can-eat buffet then this is a good option, especially since Nataraj (see below) have discontinued their lunch buffet. However, for non-ISKCON followers, a more flavoursome (and more expensive) meal could be had without the half-hour commute to Funabori from Veggie Herb Saga or the Veg Kitchen. This restaurant has five branches across Tokyo, including Shibuya and Ginza. Nataraj are Tokyo's oldest Indian vegetarian restaurant, and are somewhat of an institution among vegetarians in Japan. However I think they're cashing in on their reputation, and are now well-overpriced. They used to offer a good value lunch buffet, which was good for hungry vegetarians and vegans, but these appear to have been discontinued at most branches. Nataraj restaurants are like the antithesis of Vege Herb Saga, and in that sense they complement each other nicely. To any connoisseur of Indian food, Nataraj will have a chain-restaurant feel, and the food will taste very insipid, as if the chef forgot the spice and then watered down the curry to save money. At Veggie Herb Saga all dishes are flavoursome and spicy, being authentic Indian food, while at Nataraj food is almost flavourless by default, and chilli powder and garam masala (two essential Japanese spices used in virtually every dish) are optional, paid extras. A good vegan naan imitation and a typical, watery, overpriced "Chana Masala". Besides being watered down, in my opinion food tastes bland, mass-produced, with poor-quality spices. Portion sizes are very small, and a barely satisfying meal for two (including a drink each, poppadoms, a shared entree, two curries and two naans) comes to about 7,000 Yen. I'd pay this for a feast of authentic Indian food cooked to perfection from fresh ingredients at Veggie Herb Saga, but this is just too overpriced for what it is. In my opinion the Nataraj chain have just one purpose: to introduce "Indian" food to those who have not eaten it before (as is the case for many Japanese, who are not accustomed to spicy food). However I would strongly recommend Gopinathas (see above) in preference, as the talented chef adds a Japanese twist with herbs and spices, while food at Nataraj just tastes like the chef left out everything intended to give the dish flavour. I do appreciate that they do a vegan version of naan (see photo above), which is very rare. While most are underground or on a high floor, all Nataraj restaurants have a pleasant interior, and your order will be delivered very quickly. However the food quality is too low, and prices too high, for me to be able to recommend these restaurants. Non-Vegetarian Indian Restaurants in Japan? In much of Japan, a chana masala from the local Indian restaurant is the best vegan option. Most Indian restaurants in Japan serve North Indian food, and many have a chef who speaks some English and can prepare a vegan dish, however there are several risks involved. Many may use a pre-made non-vegetarian curry sauce for all their curries, adding chicken to a chicken curry or chick peas to a chana masala . I generally ask to speak to a chef and try to get a feeling of how honest he (it's always he) is being, and then proceed with an order if I trust he's making enough effort to ensure that my meal will be. My worst experience was at a restaurant in Nagasaki (which, not surprisingly, seems to have closed down) where the English-speaking waitress clearly understood my order, but still the roti came out smeared with ghee, the salad had a mayonnaise dressing and the curry had curd in it. They just couldn't be bothered, so I paid for the samosas (frozen on the inside and burned to a crisp on the outside) and the one roti I'd eaten, and left. This experience is, unfortunately, very common at non-vegetarian restaurants. The best way to test if a restaurant will cater to vegans is to ask about breads. Nan bread always contains milk (and usually egg, except at vegetarian restaurants) and must be prepared the night before and fermented overnight. If they staff quickly point out that nan bread aren't vegan, I trust them. If they don't think of it, it's a bad sign as they haven't really understood. If they promise to make a vegan one (as many do) I walk out, as it means they either have no idea or (in most cases) are just lying, telling me what they think I want to hear in order to get my meal order through as fast as possible. This of course does not apply to vegetarian restaurants like Nataraj which prepare vegan nan daily. 1. Small restaurants run by one or two Indians (including the chef) are a much safer bet than large chain restaurants (such as those found in shopping malls) where staff tend to come and go, food is prepared in advance (usually with meat-based stocks) and chefs are told to follow strict recipes. 2. Try to identify restaurants which are run by Hindus instead of Muslims. This seems discriminatory, but Hindus are familiar with the concept of vegetarianism, and they grow up being taught that they should be vegetarian themselves, so most hold it in high regard. Muslims, by comparison, are taught that killing animals for food is morally acceptable, as long as the animals are killed in an especially cruel manner (Halal slaughter). The difference on consciousness to vegetarianism is significant, at least from my experience. Hindu restaurants can usually be identified by gods on the walls, and never serve beef; Muslim establishments never serve pork, usually serve beef, and are more likely to specify that they use halal meat. 3. Never order a set meal, as these curries are usually pre-made, and are likely to have animal-based stocks to appeal to local tastes. 4. Order a dry curry, such as chana masala (chickpea curry) or (sometimes) an aloo gobi (potatoes and cauliflower), even if they're not on the menu. This means they're more likely to make it up on the spot (which a skilled Indian chef can do in minutes) and is thus a safer bet for a vegan meal. These two dishes traditionally don't use dairy products. 1. In Japan many restaurants (especially chain restaurants in shopping malls) add an egg to the pakora batter, to make it more like Japanese tempura.Likewise samosa pastry occasionally contains milk and/or egg, so it's good to ask whether or not they make it themselves. Many wait staff will have no idea, however, and may be reluctant to find out. 2. Rotis are often smeared with ghee (clarified butter). 3. Many staff don't think of mayonnaise (used for salad dressings) as containing milk or egg. Heading to Taiwan? Check out my page on Indian Vegetarian Restaurants in Taipei. Jesse, thank you for this helpful blog. I'm traveling to Japan this weekend for several days and was worried about ordering vegan food since I don't speak the language. I have written down the addresses to the restaurants you've recommended and can't wait to try them. Thanks! how common is English in Tokyo? I'm thinking of going there but heard people that they hardly speak English and travelling is hard. I wouldn't let that put you off. Its true that, on average, Japanese speak less English than other Asian nations, but its not a big problem, especially in Tokyo, as signs are bilingual and more people speak English than in the countrywide. If you really want to come somewhere people speak good English I recommend Taiwan, but seriously its easy and safe to travel Japan, and I recommend it.